Good Goods Social Enterprise of Social Enterprise Business Centre, which is under the HKCSS, has launched the Social Enterprise Gift Certificate Program since 2014. This programme aims to support different social enterprises, local shops, organic and fair-trade sales points while you can enjoy your consumption. The Gift Certificate can be used in more than 100 locations in Hong Kong (Hong Kong Island, Kowloon and New Territories). Take action now! It is surely a great choice for you to give as a meaningful gift and also a special way to support local social enterprises and other shops in our community. The gift certificate is only applicable to fixed price products / menu of the listed social enterprises(SEs). Please present the gift certificate before purchase, photocopies are not accepted. The gift certificate is not transferable or redeemable for cash, and no change will be given. The gift certificate cannot be used together with any other discount offers. Listed SEs reserve the right on final decision in the event of any dispute without prior notice. The gift certificate is invalid and not replaceable if lost or found defaced or damaged. Goodgoods Social Enterprise Concept Store partners with DimBuy to establish a sales platform for the sales of SE Gift Certificate. 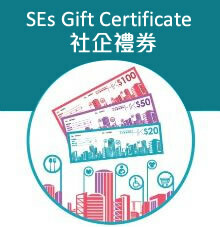 Now you can purchase the SE Gift Certificate either via Goodgoods Social Enterprise Concept Store located in Wan Chai or DimBuy Mong Kok redemption point. Take action now to support local social enterprises and fair traders! Sincerely thank Asia Miles for the long term support on the Social Enterprise Gift Certificate Program. Throughout the whole process, Asia Miles is dedicated to encourage members’ redemption on SE Gift Certificate, so as to arouse awareness on fair trade as well as boost the overall development of social enterprises. In order to provide a more convenient and user-friendly platform for Asia Miles member’s redemption, tripartite cooperation is initiated between Asia Miles, Goodgoods and DimBuy. From today onwards, not only Goodgoods shop but also our new partner DimBuy will offer the SE Gift Certificate redemption service for Asia Miles members. If you have any enquiry, please feel free to contact us at 2876 2442 / 2876 2439 / 2864 2903 or email to goodgoods@hkcss.org.hk. Your delightful choice of gift vouchers. Start your SEs tour by this voucher. ©2009 - 2019 The Hong Kong Council of Social Service.